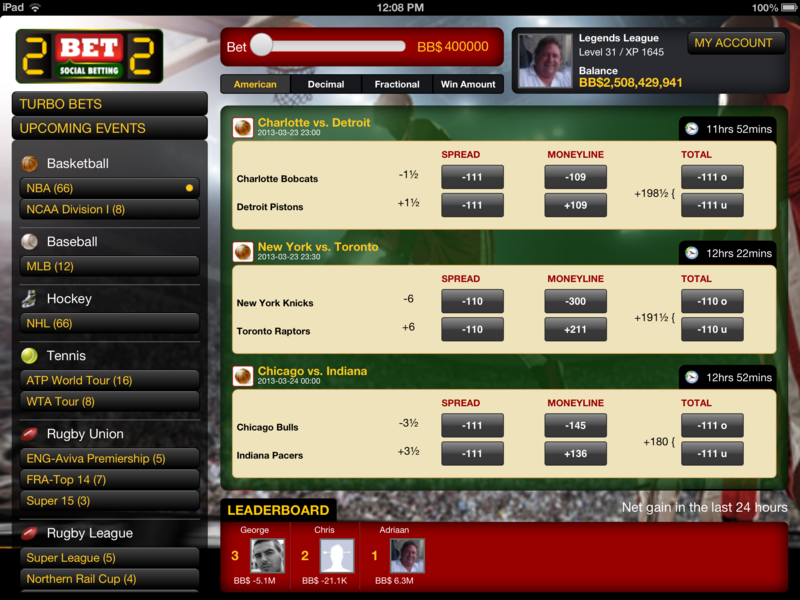 2BET2 is pleased to announce the availability of their new iPad Social Betting app in the Apple store. “Being available in the Apple store brings a new audience to 2BET2 beyond Facebook” said CEO Adriaan Brink. A dynamic user interface with clear, clean and easy-to-play iPad layout make 2BET Social Betting a friendly destination for sports enthusiasts and gamers looking to test their prowess at predicting sports results. Players can play on all of the top leagues including the Premier League and FA Cup, MLB, NBA and NHL and bet on tennis and rugby fixtures from around the world. The sporting calendar drives the fixtures on 2Bet2 Social Betting app and 2Bet2 Sportsworld provides news and views for sports aficionados. The 2BET2 Social Betting iPad app shares a common wallet with the players’ Facebook version of the game so players can play in either environment for the same virtual money and kudos points. Optimised for the iPad form factor and touch gestures the app has a completely different user interface to the Facebook app. This entry was posted in News on April 19, 2013 by admin.